Please note this blog represents a working concept, but I cannot offer any support towards the creation of an app. Sign-up if interested! A tutorial, an app, and a cause. By Lee Martin. A few weeks back I launched the In Rock We Trust campaign  for the Foo Fighters. At the end of that post, I mentioned that I wrote some software which printed the customized bills in real-time as they were minted on the site. I also mentioned that you could use a similar technique to create your own Instagram printer. Instaprint prints out Instagrams by watching out for any photos tagged with specific location or hashtags. So, let’s say you’re throwing a Halloween party next week, and you’ve told all your friends to tag their Instagram photos #haleeween2012. You could technically set up a printer to be printing off these Instagram photos in real-time as they’re taken, effectively creating a photo booth of sorts for your friends. Pair this with a nice compact photo printer and you’re creating a keepsake for every attendee. Pretty damn cool. The Breakfast Instaprint campaign turned out to be a bit too ambitious and their Kickstarter was unsuccessfully funded. They resorted to renting the device for around $5,000 a day, ouch. I want to make an analogy here that you could buy Instagram for $5,000 but we know that isn’t true. However, that is still quite a bit of money and out of the reach of most everyone. An explanation: Any developer can make use of this blog post to create their own Instagram printer or any sort of API based printing application. An app: Any user can use my Insta Printer app to set up their own Instagram printer in a few minutes, but I’ll need your help to raise some limitations I’m facing. More on that later. In the style of Jock Jams: Ya’ll ready to print? An Instagram photo with your specified tag is taken. 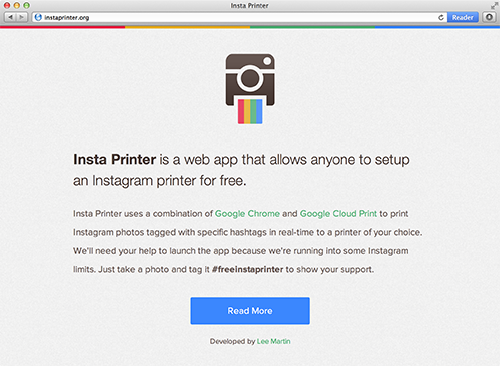 The Insta Printer app responds to a realtime update from Instagram and sends the photo in the form of a print job data to Google Cloud Print. Google Cloud Print creates the print job with specified media and target printer then proxies the print job over to Google Chrome. Google Chrome then sends the print job over wifi or ethernet to the printer. Finally, the printer receives the job and prints the photo. In order for all of this to work properly, you must be signed up to and have your printers connected to Google Cloud Print and have a properly setup, logged in, and open copy of Google Chrome running. Wait, what the hell is Cloud Print? Using Google Cloud Print, you can make your home and work printers available to you and anyone you choose, from the applications you use every day. Google Cloud Print works on your phone, tablet, Chromebook, PC, and any other web-connected device you want to print from. One common misconception of Google Cloud Print is that it only works on Cloud Print enabled printers. This is false. In fact, Google Cloud Print will work with just about any Internet connected printer as long as it has a clear line of communication to an open copy of Google Chrome. Google likes to refer to these non-cloud enabled printers as Classic Printers. When the confirmation message appears, click Finish printer registration. Google Cloud Print has been enabled. You can test your setup from the bottom of Google’s instructions by clicking the Print a Test Page link. Google also offer developers an API to automate print job submission, and therein lies the magic of this service. All you need is a Google OAuth2 access token with the appropriate permissions. Now that we know how to print, let’s work on obtaining what we want to print: Instagram photos. Instagram offers a real-time API based on the PubSubHubBub protocol which allows your app to subscribe to hashtags, geographies, locations, or users and be notified when any new associated photos are posted. The only prerequisite for setting this up is registering an Instagram application. Once you have your app client key and secret, you can setup your Instagram client. I like to use the Instagram Ruby Gem to do this. Instagram has nice documentation on subscribing to the appropriate object and responding to the incoming updates, but here’s a very simple example of how I’m doing it with the Instagram Ruby Gem on Sinatra. One thing to note is that the changed data, that is the actual photos, are not included in these updates. It is merely a notification of new media. I’ll explain how to fetch these new photos in the next section. Process each incoming subscription by passing the request body to a tag specific handler event. Fetch recent photos from Instagram which contain the required tag using the tag_recent_media function. If photos exist, loop through each and submit the high resolution photo url as a print job to Google Cloud Print. Instagram will then update your app each time a new photo is posted with the subscribed tag, and your app will pass the photo’s url off to your Google Cloud printer. Hell yeh. So that was a high level explanation of the technique I’m using. For those of you who don’t feel like programming, I’ve combined these features in a simple turn-key app called Insta Printer. Insta Printer is an app that allows anyone with a Google account and Google Chrome to setup a printer that prints Instagram photos posted with a specific tag in real-time. The only prerequisites for using Insta Printer is installing Google Chrome and setting up Google Cloud Print. Choose an Instagram hash tag. And, that’s it! You have successfully created an Instagram printer. Now all photos tagged with the tag you specified will print out on your printer. Instagram restricts all apps to only 30 real-time subscriptions at any given point. This limitation will only allow me to make this app available to 30 users at a time. Bummer. One possible solution, would be to allow each user the ability to provide their own Instagram client id and secret, but that adds another step I’d like to avoid. 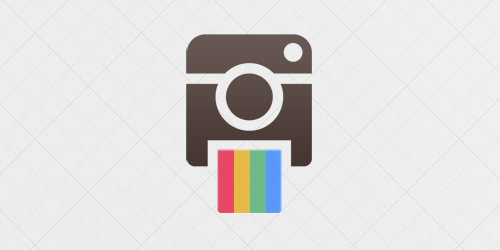 Well, we can try to get Instagram to whitelist my app so that it doesn’t run into limitations. That way, we can all, have Instagram printers for Halloween! By the time this blog gets out, I hope to have their attention, and you can show your support by taking an Instagram and tagging it #freeinstaprinter, tweeting, and upvoting. If that doesn’t work out, I’ll open-source the app here as soon as I get a second to package it up for deployment. Follow me on Twitter and I’ll let you know how that goes. Is this the best way? Probably not, but I do like that it is software only. Regardless, I think this is a testament to the power of Google Cloud Print. You could use a similar technique to create a Little Printer clone and yes, even a Foo Fighters minter. Please let me know if you have any questions or comments on Twitter or via email hi@leemartin.com. Check out that campaign here and read the behind-the-code blog here. Here’s Google’s extended instructions on connecting your classic printer to Google Cloud Print.